Shelton Veterinary Center is a primary care full-service veterinary facility providing state of the art care to a wide range of animals including small exotic pets from the diagnostic phase through treatment and recovery. Board certified specialists are available for internal medicine, surgery, radiology, ultrasound, and endoscopy. SVC provides an in-house laboratory that allows us to provide immediate results for critical patients. We are also able to perform pre-anesthetic blood work the morning of a surgical procedure for your convenience. 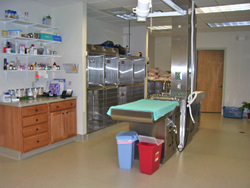 In addition, we utilize the full-service Antech Veterinary Diagnostic Laboratory. Our samples are picked up every night so we can have many of our results the following day. 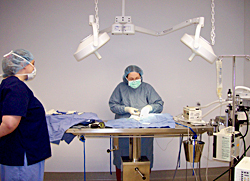 We perform many types of anesthetic and surgical procedures at SVC. We tailor our anesthetic protocol to every patient providing a safe environment for your pet. As no anesthetic procedure is without risk, (see, pre-anesthetic blood work and pre-anesthetic EKG) we use advanced monitoring equipment to ensure the safety of your pet for the duration of each procedure. We utilize EKG, SPO2, CO2, temperature and blood pressure monitoring during most anesthetic procedures. Most patients are also placed on warm intravenous fluids during anesthesia. Our veterinary technicians monitor your pets' vital signs while the doctor is operating to ensure the continuous safety of your pet. Our surgery suite is immaculate. It is sanitized after every procedure. We provide sterile surgical packs for every procedure and wear sterile attire. All technicians monitoring your pet during surgery are required to wear a surgical cap and mask to maintain sterility during every procedure. Body temperature often drops during an anesthetic procedure. In recovery, our patients are placed in heated recovery cages so they can be comfortable and increase their body temperatures gradually. Your pets' body temperature is constantly monitored until normal. The same care and monitoring is used for dental procedures, as this is also an anesthetic procedure. SVC is well equipped with a high-speed dental unit allowing us to do tooth extractions. We are also equipped with a digital dental x-ray machine to aid in superior dental care. The treatment area is the heart of our hospital, acts as the main working area and also serves as our ICU. Here patients are continually monitored, treated and observed. This area provides a staging ground for numerous minor procedures, venipuncture, and in-hospital exams. Ability to email images to specialists for consultations rather than having to mail the films. Dr Steven Heyman** is a board certified surgeon who travels to our practice for advanced orthopedic and soft tissue surgeries. Dr Eric Linnetz** is a board certified veterinarian in Internal Medicine who travels to our practice to perform Ultrasounds. We are very proud of our hospital and we are growing and expanding every day. We would appreciate the opportunity to care for your pets and the pets of your family and friends. Please feel free to call for a tour or just stop by and our staff can answer any questions that you have about our facility. A veterinarian who received a 4-year undergraduate degree and a 4-year graduate degree in veterinary medicine. A veterinarian who has a specialty. This means that this person received a 4-year undergraduate degree, a 4-year graduate degree in veterinary medicine, and internship and residency in the specialty of their choosing. 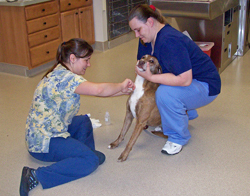 Veterinary medicine has many specialists available. Please feel free to inquire about referral services at any time.